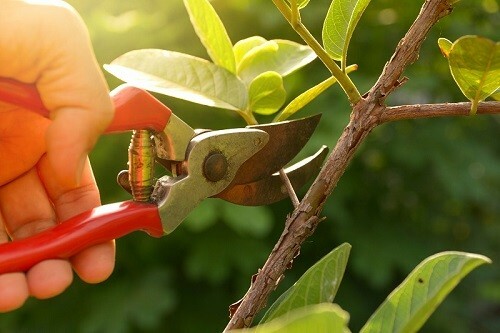 Best Pruning Shears – Many gardening enthusiasts find that roses and orchids are some of the most difficult flowering plants to cultivate. But when you’re armed with the correct gardening arsenal and top growing tips, you too can have a garden full of blooms. When it comes to tending your precious roses and orchids, only the right tools will cut it. To get the best growth and the most beautiful flowers, you need gardening tools you can trust. Whether you’re investing in tools for your own garden, or looking to sell gardening tools on to gardening enthusiasts, you should buy the best quality you can afford. One of the most important tools in your collection is a pair of quality pruning shears. If you take pride in your garden and want to work those green fingers, keep reading to learn how to choose the best pruners for roses and orchids. I shop for gardening pruning shears and other gardening tools primarily online at ToolBarn.com and Amazon.com. Roses need lots of sunshine to grow well, so make sure they get at least 6 hours of sun a day. Once you’ve put your rose bush in the soil, add organic material like manure, compost or tree bark to your displaced soil, before backfilling. The soil around your roses needs to be damp throughout the spring months. They’ll need around an inch of water each week – feel the soil with your fingertips. It needs to be damp, but not waterlogged. Add 2-3 layers of organic matter like cedar mulch, chopped banana peels, grass or even wood chippings around your roses. This’ll help keep the water in and deter weed growth. Using pruning shears, carefully prune your roses to achieve the shape of bush you want, beautiful flowers and a healthy plant. Your roses need to be pruned to promote growth and channel essential nutrients to the blooms. Your roses should be pruned while they’re still growing slowly – the cold weather before springtime is best. With high-quality pruning shears, make diagonal cuts around 1/4 inch above a new bud. You can shape your roses by placing the cut in the direction you want the new growth to form. If you see any branches that look woody or dead, prune those out, too. The more you prune, you’ll get larger roses and fewer of them. Prune less, and the opposite will be true – smaller flowers but in greater abundance. Your orchid’s parents started life in the tropics, so only a warm environment will do. Choose a spot that’s indoors, out of direct sunlight but still with a lot of sun exposure. As in tip #1, your orchid will need a warmer environment to survive and thrive. Make sure you maintain an indoor temperature of between 65-80 degrees Fahrenheit to give them the warmth they need. In their natural habitat, orchids are more likely to be found clinging to trees and other plants, rather than being planted in soil. Mix a liberal amount of organic matter, like tree bark, into the soil around your orchid. This will allow air to get to the roots of the plant and promote healthy growth. Because of their tropical roots, orchids benefit from a shower of water, the way they would in the wild. Saturate the soil around your orchid, and then leave it to dry. Once the soil is beginning to dry out, repeat the process – your orchids will feel right at home. For your orchid to bloom, you need to drive the essential nutrients from water and sunlight to the young buds of your plant. To do that, pruning is essential. It’ll remove any greedy old branches and ensure your flowers are getting the nourishment and energy they need. When a new nodule forms on an orchid, that signifies a possible new branch that could sprout with several flowers. The potential is locked inside the nodule, and you’ll need to prune it to release this potential. On a green stem, look for a nodule beneath your lowest growing flower. Now, with good quality pruning shears, trim 1 inch above it. Brown or yellow stems are sucking nutrients from the plant, and you’ll need to trim these off at the base. Aside from their perceived delicate constitutions, roses and orchids have something else in common. Both of these flowering plants are best-pruned with bypass pruning shears. Unlike other types of pruners, bypass pruners have a curved blade. This curvature allows for closer and more precise cuts. Bypass pruners also avoid the unpleasant issue that comes with flat-blade shears, which is potentially mashing up the stem when cutting. Pruning shears are perfect for stems that are 3/4 inch thick, or less. For more mature plants with thicker stems, you’ll need to use different tools, like loppers or a pruning saw. Pruning shears will be ineffective at that stage. When it comes to choosing your ideal shears, it isn’t a matter of ‘one size fits all’. Rather, there is a range of options to choose from, according to your individual needs. For example, if you’re left- rather than right-handed, there are shears with specially formed grips to fit comfortably in your hand. For those with weak wrists, there are shears that rotate. And if you have a weak grip, there are pruners with a ratcheting mechanism that do a lot of the work for you. If you’re thinking of selling pruners to fellow gardeners via eBay auctions, you’ll want to showcase a variety of pruners that cater to the various needs of today’s gardener. Without further ado, let’s get down to our recommendations. These pruners from Fiskars are a good basic model for those on a budget. They’re great for young plants and can cut to a diameter of 5/8 inch. They have a low-friction coating to protect your orchids and roses during the pruning process, and a lifetime warranty for peace of mind. These stunning professional pruners from Doolini have been made with the pro gardener in mind. They have precision-sharpened blades and a cushioned comfort grip for prolonged use, so you can prune with heightened efficiency and care. These pruners from Pexio feature an ergonomic handle and grip and are both comfortable to hold, and powerful in execution. These Pexio shears have an added sap groove feature, which channels sap away from the blades to avoid them gumming up. These razor sharp shears from Garden Elite are not only elegant to behold, but they’re crafted from Japanese steel – the hardest steel on the market. With this technology in place, these pruners are strong and sharp and have a lifetime warranty, too. These shears by Gardenia have a strong blade that can cut thicker than normal branches. The blade has a non-slip coating, for both safety and precision. They include stoppers so the stress on your wrist is reduced while pruning, and feature a sturdy reinforced fiberglass handle. With the Jaw’s high-carbon-coated steel blade, there are no more fears about your blade bending or snapping. The shears have been designed to stay sharp for longer than standard pruners. The grip is designed to be kinder on joints and minimize injury. These heavy-duty shears from PrecisionPRO have an inclined titanium-coated Japanese steel cutting blade for faster and quicker pruning. The pruners have an ergonomic grip to suit larger and smaller hands, so are great for male and female gardeners alike. The Corona ClassicCut pruners will cut through branches up to 1 inch in diameter – perfect for maturing bushes and plants. With safety in mind, the manufacturer has also built in a notching tool when the pruner isn’t being used, to avoid accidents and injury to the user. We’ll end with the most stylish pruner on our list – a stylish pair of shears from Garrett Wade. The pruner is made from finely forged steel, and its powerful blades can prune and trim in an instant. This set of shears comes with its own leather holster, too, for that dapper touch. Roses and orchids require care when it comes to pruning, and to do that you need the right set of pruners for the job. Bypass pruners are the best shears for roses and orchids because of their capacity for precise and clean cuts, leading to healthy growth. Are you looking to share your knowledge and sell the best pruning shears? Then check out our FAQ section and see how we can help.